Norway’s two major farm lobbying groups once again broke off negotiations with the state over how much subsidy and protection they should receive from taxpayers. They wanted a billion kroner more in financial support than the government was willing to give, while the government claims the farmers showed little willingness to reach an agreement. It was widely expected that the farmers wouldn’t accept the state’s offer of another NOK 410 million in financial support. 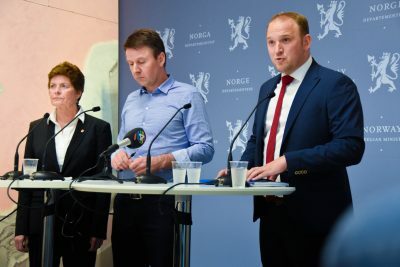 They demanded NOK 1.4 billion, which would have given farmers raises of more than 9 percent on average, compared to the 2.4 percent granted most other working groups in Norway this year. The state Ministry of Agriculture thus wouldn’t meet their demands. Both sides faced a negotiating deadline on Monday evening, but after intense negotiations they walked away from the bargaining table. Norges Bondelaget and Norsk Bonde- og Småbrukarlag confirmed talks had broken down. The state offered extra subsidy and support that would have resulted in an average of NOK 9,000 more per farmer, while the farmers demanded NOK 31,000. “The government isn’t showing any willingness to invest in agriculture,” claimed Bondelaget’s head, Lars Petter Bartnes, who also accused Agriculture Minister Jon Georg Dale of failing to follow up the Parliament’s agricultural policy. Bartnes claims farmers deserve raises that are more than triple those granted other working groups because farmers’ incomes allegedly have lagged behind over the years. Dale rejected Bartnes’ assessment. He claimed the government went to great lengths to pacify the farmers, who rarely if ever express satisfaction with the taxpayer support they receive in Norway in the form of subsidy and protectionism that blocks cheaper imports and keeps food prices high. Dale said the increase offered by the state would allow a farm with just 15 cows to earn around NOK 569,000 a year. Anything more would veer the government away from the economic moderation needed at present, Dale claimed. It’s become a spring ritural in Norway that the farmers make high demands, the government slashes them, talks break down, the farmers protest in the streets of Oslo and the Parliament ends up striking a compromise. Dale maintained that the farmers’ demand for 9 percent pay hikes was “much, much too high. It’s unclear whether the farmers will be able to win support in Parliament for their demands, even though Parliament refused to approve all the agricultural reforms Dale has proposed. Even the pro-farmer Center Party would be hard-pressed to justify giving farmers such big pay hikes at a time when Norway is recovering from years of layoffs and economic distress after oil prices fell.